Brown the stew meat in a skillet. You’re not going to cook it all the way through, just sear it. Cook the sausage all the way through and drain any fat. 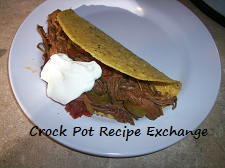 In the meantime, add potato, celery, carrots and brussel sprouts in a 6 – 7 quart crock pot. Once meat is cooked add it to the crock pot too. Now dump the cans of tomatoes, beans and enchilada sauce. Add onion, garlic, mustard, worcestershire sauce and cumin. Stir to incorporate everything. If the ingredients are exposed, add just enough water to barely cover everything. Cook on high for 2 hours (you looking for it to bubble around the edges). Turn to low and cook and additional 5 – 6 hours. Serve by ladling into bowls. I served with a dollop of sour cream on top and a spoon of salsa.